Got to see my longtime friend Fred get married to his sweetheart Kathy this weekend. The wedding was held in a Catholic church and involved some rituals and practices I was not familiar with, but it was also interestingly casual; the ceremony was not particularly long, it was conducted in English, and it had some sort of religious folk songs playing during interludes, with live vocalists and instrumentalists. 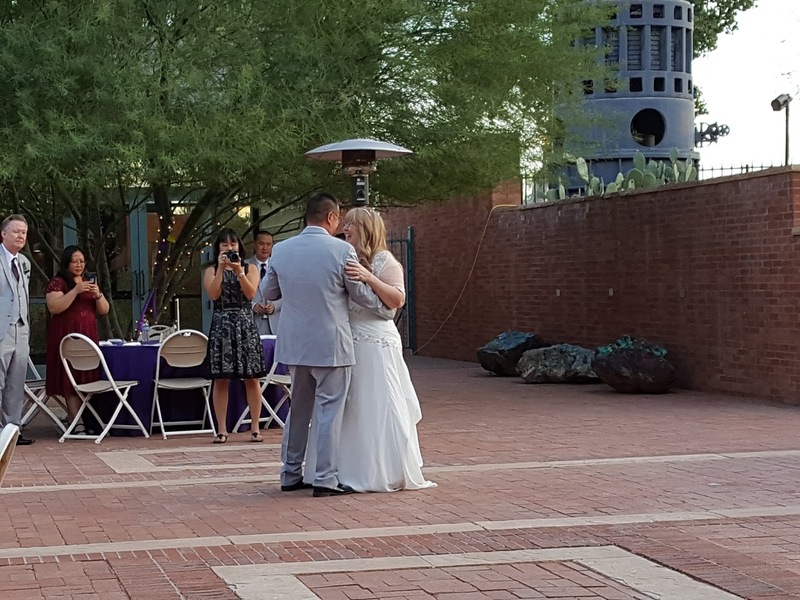 The officiant even told a story about Dungeons and Dragons while marrying them. Pretty nerdy! But I have to say it was very moving despite not being heavy-handed or overwrought at all. I think maybe I just bring that to the table myself because I love human rituals and what they mean. 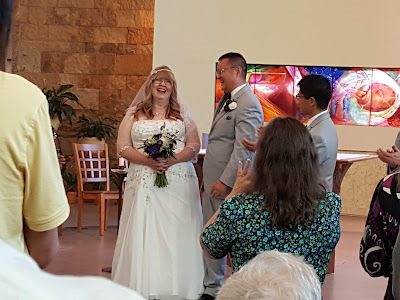 I cried a few times during the ceremony and a few more during the reception. I think I would never make it through a wedding if I was one of the parties being married. I would just break down and cry unless I had a lot of training to avoid it or something. And it probably still wouldn't work. I've been part of the wedding party in several weddings in recent years--as a bridesmaid in both my sisters' weddings and the wedding of my best friend--and I struggled to keep a nice balance between getting invested in the words being spoken and not getting too invested because then I'd become a gross mess and probably look like I'm trying to get attention. 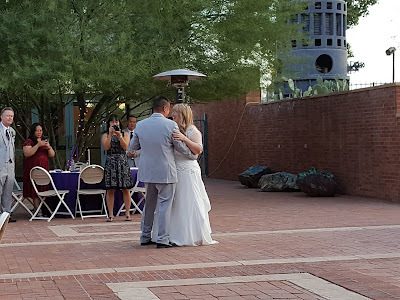 Even with all that, with what weddings mean to me, with how wonderful it is to see people find each other and experience all those firsts together, I have never desired it for me. Planning a wedding just seems like an outright nightmare, even if you have a small one, and I don't have or want a relationship along the lines that would lead to a wedding. The phrase "always a bridesmaid, never a bride" makes me sad--I don't like thinking about what other people believe about single women, and how we're almost always processed as pathetic or sad. "What about you, are you not married yet?" someone asked me at this wedding. I have a hard time answering stuff like that, because I want to be polite and not cause problems, but I also don't like the "yet" on the end of that sentence. As much as I adore the celebrations our culture has for love, I really dislike how hyperfocused we are on perceiving marriage as the necessarily ideal situation for adults to live their lives. I think it's true that more and more people are avoiding marriage or choosing to stay single, but the narrative definitely hasn't shifted yet to understanding that as a choice made intentionally versus by default if you can't get anyone to choose you. I wish more people understood how I can cry at someone's wedding without assuming I wish it was me.